In the State of Michigan property taxes are vastly different for primary residences and other properties. Primary residences are exempt from an additional 18 mil school tax. 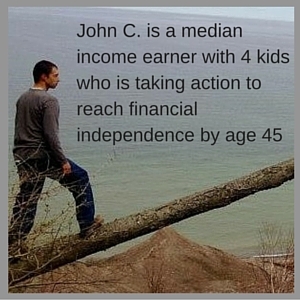 Depending on the other taxes in your local area this typically amounts to anywhere from a 25% to a 50% tax savings. For a property worth $100,000 this tax amounts to $900 per year. Typically when purchasing a property the Principal Residence Exemption Affidavit is filled out and delivered to the township assessors office. From time to time this form is missed, or over time the nature of the property changes from a secondary residence to a principal residence. Residences for which the Principal Residence Exemption has been accepted are considered homesteaded in the State of Michigan. What Property Qualifies For A Principal Residence Exemption? Essentially if you own the property and live in it for the majority of the year, and do not claim the same exemption or a similar exemption anywhere else, then the property qualifies for the Principal Residence Exemption. Vacant land zoned residential that is adjoining or contiguous to your primary residence also qualifies for the exemption. If you are already getting the exemption it will be noted on both your property tax bill and your yearly property assessment form. If you are unsure if you are getting the personal residence exemption your local assessor should be able to provide you with that information. As with anything there are always special circumstances. The State of Michigan has more information on their website here. On this publication PRE Guidelines they go over several different scenarios to determine if you qualify for a Personal Residence Exemption. 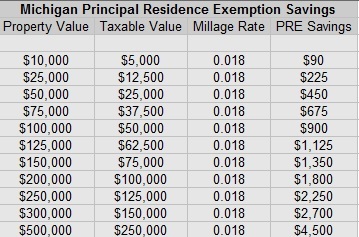 As an example, I own 6 total lots that have received a principal residence exemption. Lot 1 is the lot my house is on (green) and it touches lots 2 and 3 on its sides. Lot 4 touches my home on its back side. All 3 of these lots (yellow) qualify because they are adjoining the lot my actual home is on. Lot 5 does not touch lot 1, but it does touch lot 4, making it contiguous. Lot 6 does not touch lot 1, but it is contiguous (blue) because it touches lot 5. How Much Can You Lower Your Property Taxes? As you can see the more the property costs the more you can save. 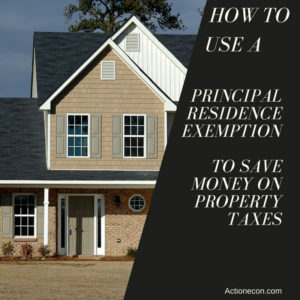 Regardless of the property value a Principal Residence Exemption is always worth going after because it doesn’t cost anything to apply for one and the form is extremely easy to fill out.Keep in mind these savings are every year. On an average $150,000 home a principal residence exemption can save $1,125 per year, every year. Missing this one form could therefore cost $33,750 over a 30 year ownership period. Another great thing about Michigan is how our property tax increases are limited through prop A. The assessed value can change drastically at any given time to reflect the market, but once the taxable value is set, it can not be increased by more than 5% OR the rate of inflation each year, whichever is lower. As I mentioned above, the form is incredibly simple to fill out. You enter the property number, address, and location as well as your name and other identification information. After that there is a series of Yes or No questions, and you sign and date at the bottom. Pretty simple right? You can deliver it in person to your township assessor, send it in the mail, or scan and email it to them. For a current copy of the Principal Residence Exemption Form, Click Here. Is There A Deadline For Filing The Principal Residence Exemption In Michigan? Yes and No. You can file the exemption any time, however there are deadlines by which it needs to be filled before if you want it to affect the upcoming property tax bill. For summer tax bills the form needs to be received no later than June 1st. For winter tax bills the form needs to be received no later than November 1st. This is important information as you can not file a principal residence exemption retroactively. If you miss the deadline your next tax bill will not include the exemption. What If My Principal Residence Exemption Is Denied? As I mentioned earlier, there can be complicated situations. 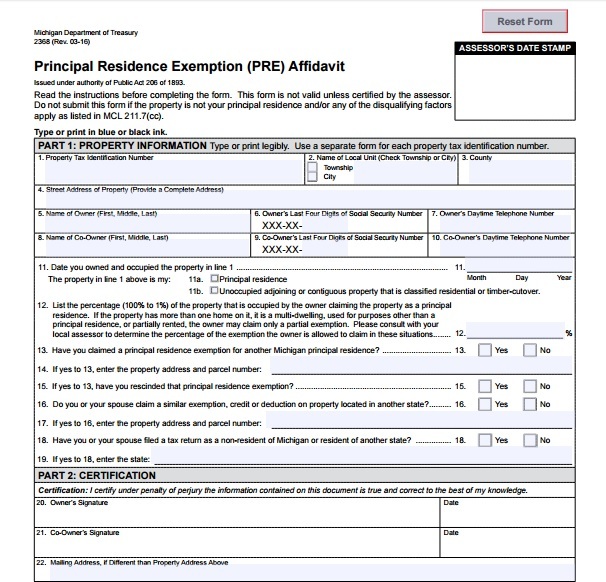 If you have read through the Principal Residence Exemption booklet provided by the State of Michigan and feel that you are entitled to a PRE and your township or city assessor has denied your PRE affidavid, then you can always provide more evidence and file again, or take it a step further and file with the court of appeals. I would highly recomend meeting with the assessor in person in a situation like this. It is easy to get heated int hese situations, but having a positive and friendly demeanor will go a long way (by the way this works in most encounters with humans). Jennie Nass of Saugatuck Michigan went through this process last year when we exemption was denied because her husband claims a similar exemption in another state. Jennie was able to prove that she was a Michigan resident and used the home all year round as her primary residence. She owns a home on Lake Michigan with a taxable value of $495,000. Resolving her principal residence exemption problem saves her around $9,000 per year. Each time I have bought a house I have filled out a PRE form at closing. When I bought the railroad property behind my house I didn’t even think about it until I received my first tax bill, which was of course not homesteaded. Around the same time I realized I was not receiving the PRE for my railroad property, which qualifed since it was adjacent to my primary residence, I also realized the date was fast approaching to appeal the property tax assessment. I focused on this and decided I would fill out a PRE form and send it in after the smoke had cleared on the assessment appeal. Not only did I win my assessment appeal, but they also went ahead and filed a PRE for me because they noticed the property was adjacent to my primary residence, talk about a win! In retrospect I should have done it the opposite way because the principal residence exemption was guaranteed to result in a substantial reduction in taxes, while an assessment appeal can always be rejected. In May of this year when I purchased an additional 1/2 mile of railroad bed behind my house, I filed a personal residence exemption immediately because the June 1st due date was fast approaching. It took me under 5 minutes to fill out the form and send it to my assessor. Since the property is congruent to my principal residence through the adjacent railroad bed it too qualifies for a Principal residence exemption. Are you paying too much in property taxes? Check to see if your property is homesteaded or not.